A breakthrough trial has provided the first glimmer of hope that Parkinson’s disease could be reversed. 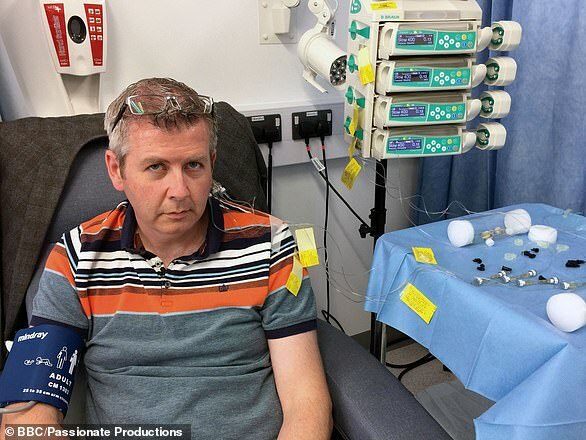 British neurologists have regenerated brain cells damaged by the condition for the first time, using a special implant that injects drugs deep into the brain. The researchers, led by experts at the University of Bristol, admitted they had failed to prove the GDNF treatment actually improved patient’s symptoms. But scans showed they had reversed six years’ worth of damage to key parts of the brain. They believe a stronger dose of the drug, and a trial designed in a different way, could prove the drug will make a huge different to people’s lives. Around 145,000 people in the UK have Parkinson’s, which causes tremors, slow movements and muscle rigidity. And more than 1 million people alive today will develop the condition later in life. Despite years of trials there is currently no cure and no way of stopping the progression of the disease. Study leader Dr Alan Whone said: ‘The spatial and relative magnitude of the improvement in the brain scans is beyond anything seen previously in trials of surgically delivered growth-factor treatments for Parkinson’s. The £3million trial of 41 people showed that people given GDNF experienced a 17 per cent improvement in symptoms in nine months – but this was not judged to be significantly better than the 12 per cent improvement in those who received a dummy ‘placebo’ drug. Because they had aimed to show a 20 per cent difference the trial was seen to have failed. Despite this the scientists remain remarkably optimistic. While the average impact was modest, some patients showed a dramatic response – with one man regaining his expertise in clay pigeon shooting and others taking up cycling for the first time for years. The scientists also pointed to scans which show the drug infiltrated the whole of the putamen, the part of the brain affected by Parkinson’s. The device – called convection enhanced delivery implants – injects the drug glial cell line derived neurotrophic factor (GDNF) deep into a patient’s brain. GDNF helps brain cells damaged by Parkinson’s recover and regrow, lab studies have shown. But GDNF is too big to pass from the bloodstream into the brain, which stops it being given as a pill. In order to deliver it to the cells that need it, patients must undergo complex surgery to have the implant placed in their brains. 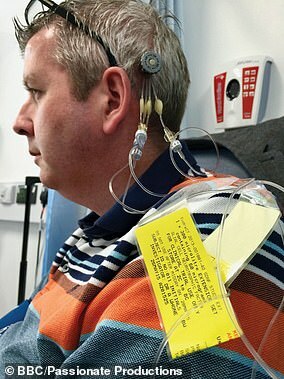 This allows GDNF to be pumped to the correct part of the brain with ‘pinpoint accuracy’. Brains scans showed signs that damaged cells may get stronger due to GDNF. Damaged cells throughout the putamen were regenerated, reversing the damage by roughly six years. The scientists are convinced that by trebling the dose of the drug and altering their trial design they could prove that it not only has an impact on the brain, but also significantly erases symptoms. Unusually, they have already received regulatory approval to further test the drug on hundreds of people in a large ‘phase three’ trial, although they need roughly £76million of funding to proceed. The results – published in the Brain journal and the Journal of Parkinson’s Disease – also pave the way for the new drug delivery device to be used for a variety of other conditions, including brain cancer and motor neurone disease. 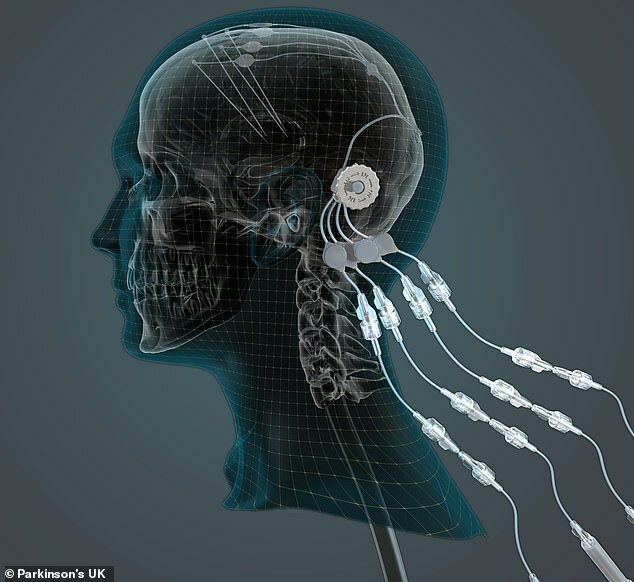 The device, called a ‘convection enhanced delivery’ implant, allows doctors to inject drugs through a port in the side of the head, down a tube directly into the key part of the brain, bypassing the blood-brain barrier which usually keeps drugs out. Dr Whone said: ‘The failure to produce the same effect on symptoms could be for a number of reasons. ‘It may be that the effects on symptoms lag behind the improvement in the brain scans, so a longer double-blind trial may have produced a clearer effect. ‘It’s also possible that a higher dose of GDNF would have been more effective, or that participants at an earlier stage of the condition would have responded better. 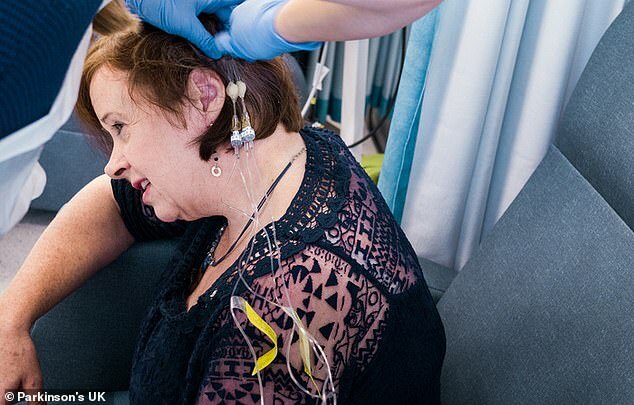 ‘This is why it’s essential to continue research exploring this treatment further – GDNF continues to hold potential to improve the lives of people with Parkinson’s.’ The initial trial was funded by Parkinson’s UK and the Cure Parkinson’s Trust. But a phase three trial, which will require up to 1,000 patients at sites around the world, needs 25 times as much money. MedGenesis, the small company that makes GDNF, is keen to continue with the trials but cannot fund such a huge trial. Pharmaceutical giant Pfizer had previously agreed to fund the drugs’ future development, in return for a worldwide licence to distribute the drug. A father-of-two claims a pioneering drug trial has given him ‘hope’ of one day walking his daughters down the aisle. Bryn Williams was diagnosed with Parkinson’s disease when he was 36 after he noticed a tremor in his right arm. His symptoms progressed to stiffness and cramping in his feet, making it difficult for him to walk. Spurred on by a dream to give his daughters Ella, 16 and Rebecca, 15, away on their wedding day, the patent lawyer, 48, helped raise £131,000 to fund the £3million GDNF trial. ‘Everything I do, I do for my daughters’, he said. ‘All I want to do, is if they get married, walk them down the aisle. That’s all I want to do, it’s my sole mission in life. ‘There’s no more powerful a word in the English language than hope and I didn’t really understand that until I was diagnosed’, he said. 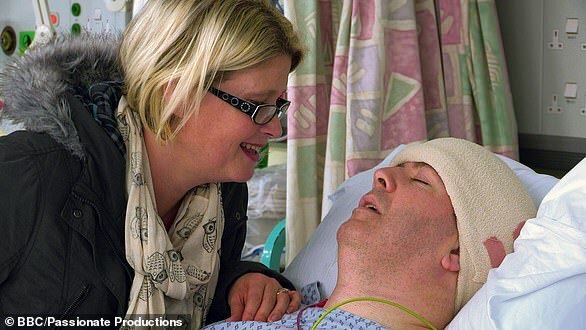 Mr Williams, who features in an upcoming BBC Two documentary about the trial, was one of 41 participants to undergo complex brain surgery to test the drug. ‘Everything I’d done up to that point was artificial hope and this was real hope’, he told the Daily Mail. ‘The worst that could have happened was I died on that operating table. Although the clinical trial failed, Mr Williams claims he felt the drug work. He started noticing small things such as driving and pushing things with his right hand – which his symptoms had left him unable to do. ‘I felt my body come back to me’, he said. ‘People noticed the fluidity of movement. The expression back on my face. ‘They noticed that I was smiling again, I wasn’t looking at them blankly as if to say what are you talking about. The Parkinson’s Drug Trial: A Miracle Cure? airs tomorrow night at 9pm on BBC Two. But last year Pfizer annnounced it was pulling out of the neurology sector and would no longer be investing in Alzheimer’s and Parkinson’s treatments. 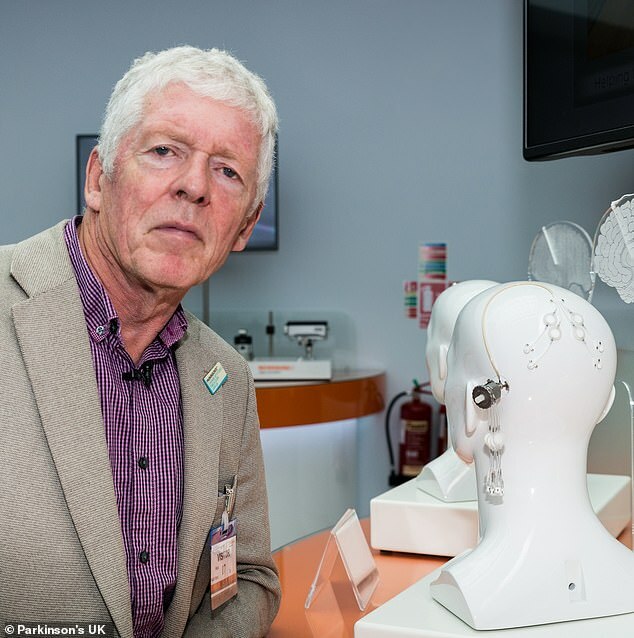 Professor Steven Gill, the designer of the device and a neuroscientist at Southmead Hospital in Bristol, said the team is embarking on a short ‘lead-in’ section of the phase three trial, in order to banish any doubts and attract funding for a full trial. ‘Even at a low dose we have seen evidence of patient improvement, which is incredibly encouraging,’ he said. ‘Now we need to move towards a definitive clinical trial using higher doses and this work urgently needs funding. ‘I believe that this approach could be the first neuro-restorative treatment for people living with Parkinson’s which is, of course, an extremely exciting prospect.’ Dr Arthur Roach, director of research at Parkinson’s UK, added: ‘While the results are not clear-cut, the study has still been a resounding success. ‘It has advanced our understanding of the potential effects of GDNF on damaged brain cells, shown that delivering a therapy in this way is feasible and that it is possible to deliver drugs with precision to the brain.’ But Professor Kevin McConway of the Open University, said: ‘I know from family experience how devastating Parkinson’s disease can be, so the prospect of a potentially effective treatment is very appealing. ‘But there are glass-half-full and glass-half-empty ways of looking at these new research findings.